It was early on a Monday morning when the buzzer rang. FedEx was at the door, delivering a compact box containing one of the best . . . surprises . . . ever. Tucked inside the parcel was my Nextpedition trip console – and an envelope that would reveal my first Farbarian-meets-Adrenalista-match-made-in-travel-heaven destination: Kauai! Three days later, my husband and I were bound for the not-so-Farbarian town of Newark, N.J., to catch an 11-hour flight to Honolulu, where we’d hop a 30-minute flight to Lihue, Kauai. So when I saw that my initial Nextpedition destination was Kauai, I felt a pang of nostalgia mixed with total Ozaist excitement. Kauai has a reputation for being one of the more authentic, off-the-grid islands within the Hawaiian chain, which ran in line with my Farbarian tendencies. In other words, you’ll never find me booking a getaway to a town like Vegas. Our crash pad for the next four nights was the Koa Kea, a sweet boutique hotel on Poipu Beach, along the island’s south shore – or, as we were promptly informed, the “sunny side” of Kauai. The Nextpedition Specialists got it right. The Koa Kea is luxe yet intimate, centrally located yet not overrun with tourists – exactly my kind of hotel. Some of my favorite features: a spacious, lava rock-adorned hot tub; plush feather beds; and the front-and-center view of the isle’s sunsets, ideally viewed from loungers set up on the grass and directly angled toward the sun. The following morning, it was off to breakfast (how have I gone so long in life without drizzling coconut syrup on my pancakes? ), where we reviewed our Nextpedition-selected plans for the day, broken down by Things to Do, Lunch Picks, Dinner Spots, and Late Night Fun. Within each category, the Nextpedition team offers their top three suggestions; if you’re hankering for more ideas, there’s a Guide tab on the console featuring additional Lonely Planet recommends. After some obligatory time spent by the pool and that heavenly lava tub, we rented a car at a neighboring hotel and headed for two top-pick sights on our console: Wailua Falls and Waimea Canyon Outlook (pictured above). If you grew up – or lived through and survived – the 70s, you’ll no doubt recognize this phrase: “The plane! The plane!” The double waterfall that had a cameo in the opening credits of the cult TV show, Fantasy Island, was none other than Wailua Falls, which you can spy from an outlook that extends above the rapids. It’s about a 45-minute drive from Wailua to west Kauai, where the landscape turns arid and the exposed earth is colored a vibrant ochre shade of red. The winding drive – both up and back down – to Waimea Canyon (referred to as the “Grand Canyon of the Pacific”) is stunning. At one point, it almost seems as if the meandering road will roll you directly into the Pacific Ocean, a rainbow undoubtedly overhead. Ask my husband and he’ll extoll the beauty that was Wailua and Waimea – and then rave about the belly-filling regional Hawaiian love that was Roy’s Po’ipu Bar & Grill. In fact, he’s still talking about the falling-off-the-bone glazed ribs he inhaled for dinner that night. Although the ambience isn’t terribly memorable – the spot is oddly situated in the middle of a small shopping mall – the food served at this joint more than makes up for it, thanks to the ingenuity of the restaurant’s namesake: Roy Yamaguchi of Iron Chef fame. Another score for the Nextpedition team. It was an auspicious segue to what would become one of the best days of our entire trip. I’m talking about Mystery Activity Day. 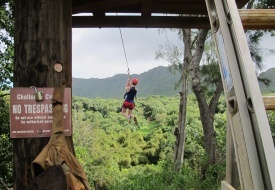 If you happen to find yourself on Kauai, and you’re a Farbarian-Adrenalista like myself, this can only mean one thing: Dangling from a metal wire, so you can zipline across a rainforest canopy. My full-day Adrenalista quotient encompassed a dose of everything that makes this lifelong athlete tick: Kayaking, hiking, soaring above the tree line at a speedy clip – followed by more hiking, ziplining, and kayaking. 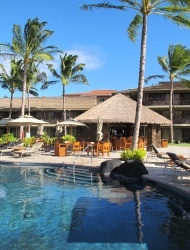 Yes, you burn an inordinate amount of calories, but your reward at the end of the day is a Mai Tai beside the Koa Kea pool – just in time for the sunset. That, to me, is the ultimate in vacation satisfaction. Flying above the treetops isn’t half bad, either. During our time on Kauai, this Farbarian made two observations, both of which complement each other in an unexpected way. The first is just how many convertible Mustangs canvass the roads of Kauai – in every imaginable color of the rainbow. This leads to my second point, which is just how many rainbows you’ll spot if you rent a Mustang (with the obligatory top down) while exploring the island. 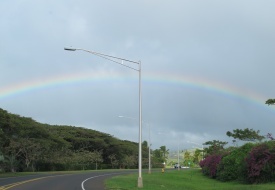 It was during one of these stops that it occurred to me how these daily rainbow sightings were another example of those unplanned, magical travel surprises that I mentioned in my last post. In my 30+ years of trekking across this beautiful planet, I hadn’t yet had such a Technicolor experience. It seems like such a simple thing – no ziplines, waivers, or helmets required – yet the thrill of anticipating that rainbow waiting for us around the bend was no less memorable. Of course, I hadn’t yet learned what the Nextpedition team had planned for me at destination #2. Stay tuned . . .